Johnson interacted with members of the packed crowd at The Matadome. Photo by David Hawkins. After one of the most decorated careers in NBA history, when he was a five-time world champion and three-time MVP for the Lakers, Johnson was enshrined in the Naismith Memorial Basketball Hall of Fame. Photo by David Hawkins. 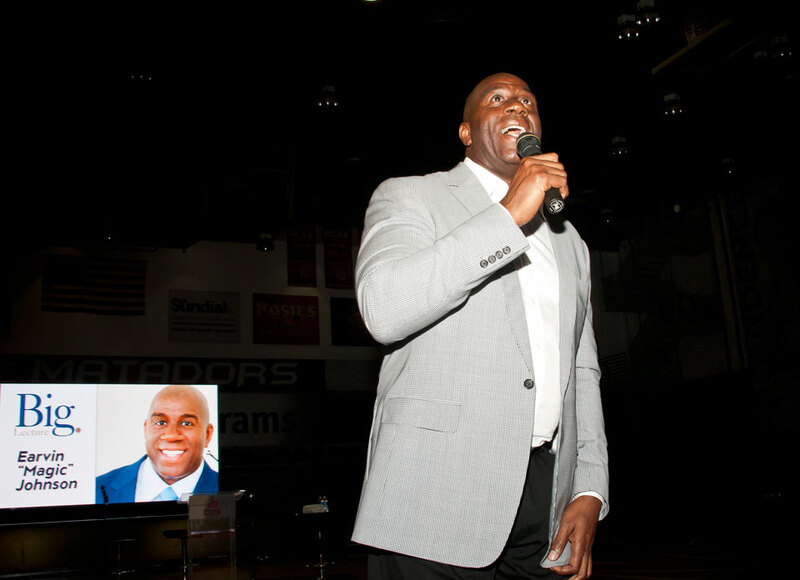 Earvin "Magic" Johnson presented the annual Big Lecture at The Matadome on April 4. Photo by David Hawkins. CSUN's basketball coach Reggie Theus sat in the audience to listen to Johnson's lecture. Photo by David Hawkins. Earvin "Magic" Johnson gave autographs to his fans after his Big Lecture at the Matadome on April 4. Photo by David Hawkins. Earvin "Magic" Johnson posed for a picture with CSUN's basketball coach Reggie Theus and his team. Photo by David Hawkins. CSUN's women basketball team with Earvin "Magic" Johnson. Photo by David Hawkins. 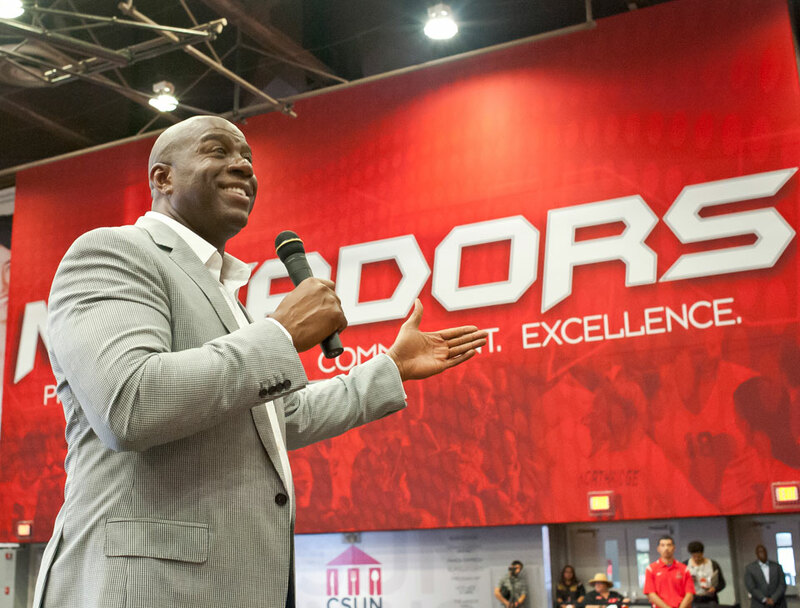 Basketball legend and successful entrepreneur Earvin “Magic” Johnson visited California State University, Northridge for the annual Big Lecture, on April 4 at The Matadome. 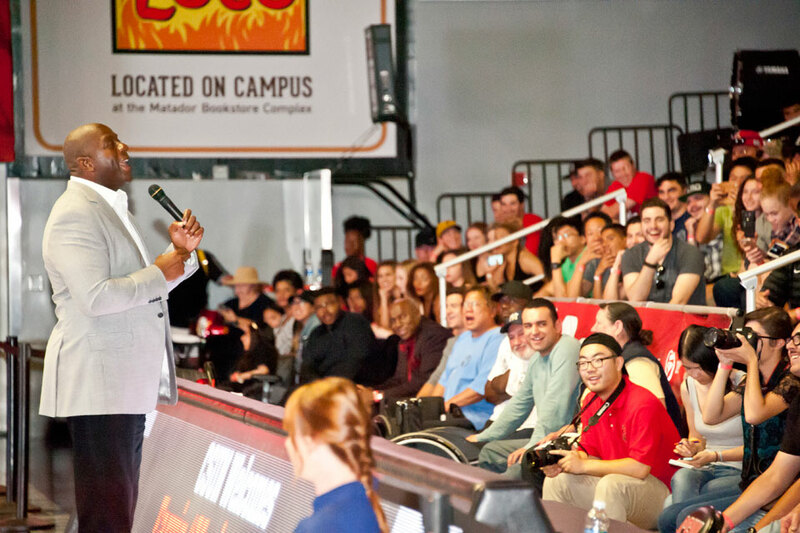 Johnson — a five-time NBA champion, three-time MVP Award winner and a member of the Hall of Fame — spoke to CSUN students and members of the community about his professional success and how his failures motivated him to overcome challenges throughout his life. The Lakers star retired in 1996, shifting his focus to business, entrepreneurship and philanthropy. He is co-owner of the Los Angeles Dodgers, the Los Angeles Sparks of the WNBA and Major League Soccer’s Los Angeles Football Club. He is also chairman and CEO of Magic Johnson Enterprises, which fosters underserved communities. “Yes, be about making money and being successful, but also go back to your community and helping someone else,” he said. Johnson shared stories from his childhood in Lansing, Mich., where he grew up owning just two pairs of pants and three shirts. But growing up in hardship never discouraged him from striving for success, he said. During the lecture, his eyes eventually fell on the Matador banner hanging from the ceiling of The Matadome — and Johnson said he embraced its slogan. He encouraged students to be determined, committed and to take chances — especially in their professional lives. “Just get into a company and prove that you’re the best,” Johnson said. “Be the first one there, the last one to leave and keep asking if people need anything else. Be professional and become indispensable. That’s what you’re striving for. The crowd capped Johnson’s lecture with a standing ovation after he interacted with individual audience members, including singing Happy Birthday to a female student and giving a shout-out to a young boy. Granese, a cinema and television arts junior, said he is a big basketball and Laker fan, and was looking forward to the event.